Scott Linton was left to rue missed chances in East Fife’s cup match against Partick Thistle. 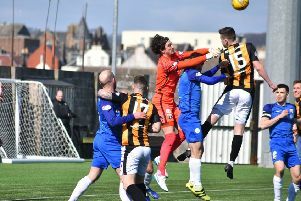 The defender says the home side should have got on the score sheet against the Championship side and given themselves a chance to win the Scottish Cup tie. Speaking after the match he said: “I think a few of the boys in there are disappointed that we didn’t take our chances. “We had a wee 10 to 15 minute spell just before half time when we were in the ascendancy and we had a few chances. “We just didn’t take them and sometimes that happens, then they scored from a set piece which is disappointing as well. “We had another couple of chances in the second half. “There was a ball whipped across the six yard box that was just out of reach and we can’t capitalise on it. “In football sometimes you get them and sometimes you don’t. Both sides had to deal with a strong wind throughout the 90 minutes which Linton said had an effect on the match. “It was really difficult to play in,” he said. “Wind is always the hardest one to play in; you don’t which way the ball is going to go, you don’t know which way it’s going to drop, so you just have to play percentage football. “It’s more about turning them and when you’ve got the wind behind you it’s about trying to keep it on the ground and not wasting possession. Now Linton is looking forward to Friday’s televised Irn-Bru Cup semi-final at Ross County. “We’ve done well against full time teams this season,” he said. “We’ve nothing to lose really so we’ll go up there and give it our best shot and battle to the end. “It’s a great occasion for the club and an opportunity for the players. “Not many of us have played in finals, or even get the chance to play in one.